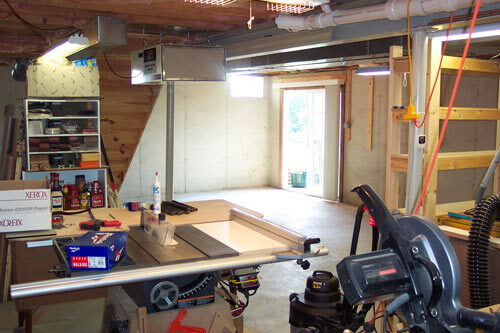 9/8/2003 It's my biggest 'Honey Do' home improvement project yet. 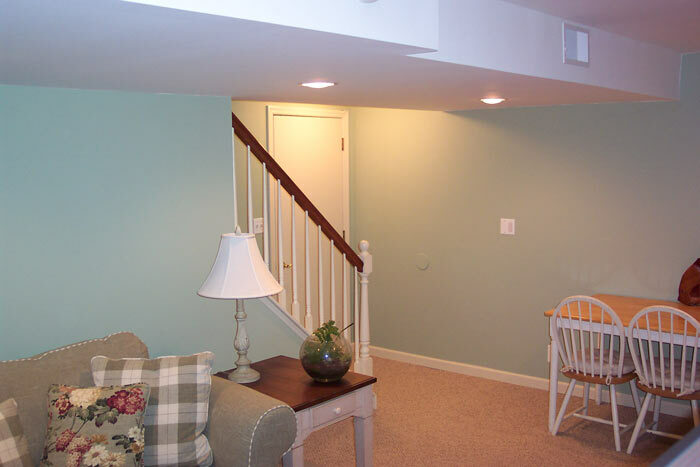 After months of hints and prodding, I broke down and agreed to add some living space to our home by finishing a third of our walk-out basement. The following are logs that I am making as I go along so that you can check in on my progress (and let me know of all of those code violations you see :-). By the way, the reason that we are adding this space now is that we really needed a separate kids' room and this will serve this purpose well. But first let me put in a plug for my wife's photography web site where you can peruse her artwork, and even download a print to put on your wall. Just click on the banner below. 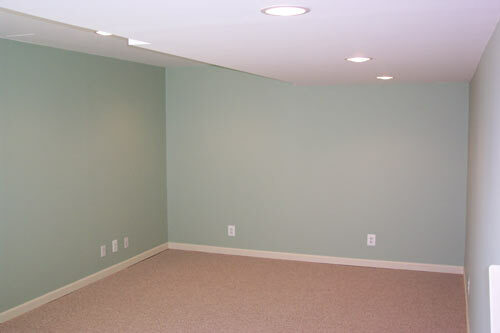 Now, let's finish my basement!!! 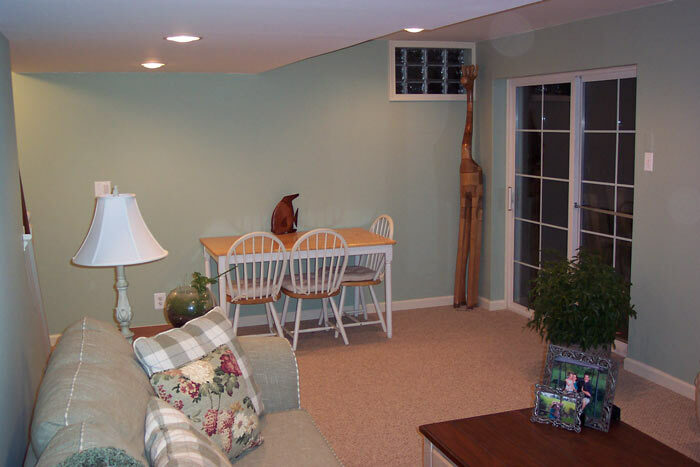 Log Entry 1: The first thing that was necessary was to actually make room in the basement given that the area where I was putting the room housed the pantry, excess furniture, a wall of shelves and bookcases, and a whole lot of junk. So off I went to the Salvation Army where I made a number of donations, giving away probably a third of our 'stuff' so as to make some room. 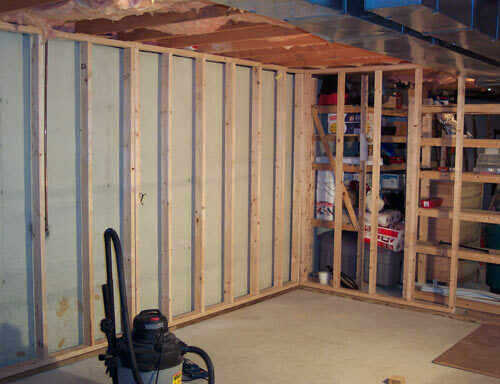 Log Entry 2: Here are some photos of the space that is being finished off, once I cleared out all of the stuff. 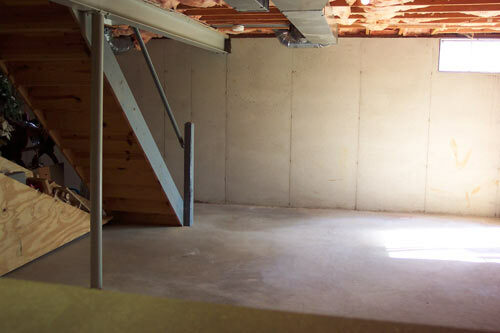 The space is about 12' x 23' with a ceiling of 6.5' under the ducting and 7.5' otherwise, and will suit a playroom/entertainment room. 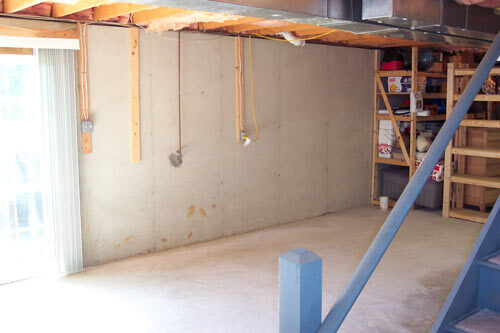 It has your typical poured foundation walls and a concrete slab floor. First order of business: off to Home Depot for some wood! Log Entry 3: I think they know me by name at the Depot . . . Anyway, as I started laying out my framing, I took a gander at potential problem areas; there were four. 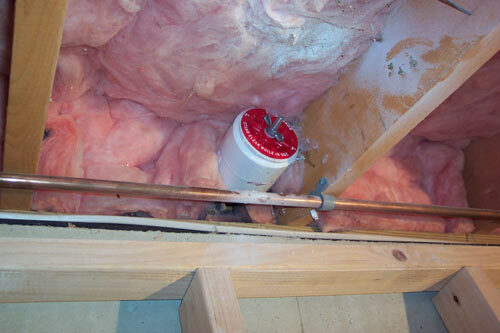 Here you can see the radon piping sticking down from the ceiling; it's definitely in the way. 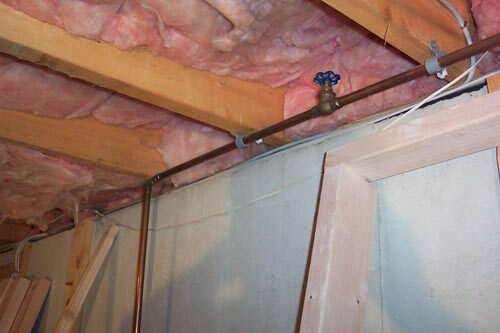 Then there's the water pipe that goes to the outside faucet; it's definitely in the way as well. There's all of the HVAC ducting, but I'll just need to frame around it. And finally, there's that I-beam. Now what to do with that . . . I cut the radon pipe back and fitted it with the expandable plug you see below; it's not used nor ever will be, so this should work fine. 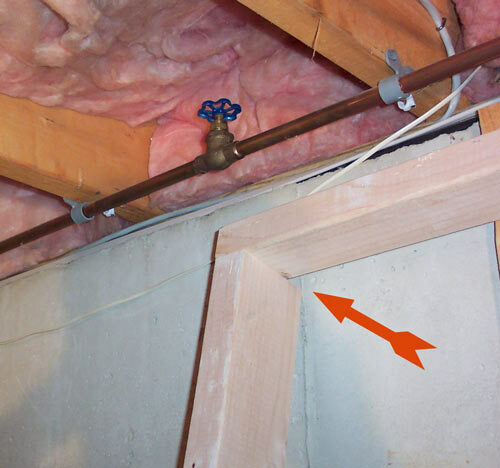 As to the water line, I needed to notch out the back side of the top of the wall I'm framing to account for it, and the arrow below shows it done. 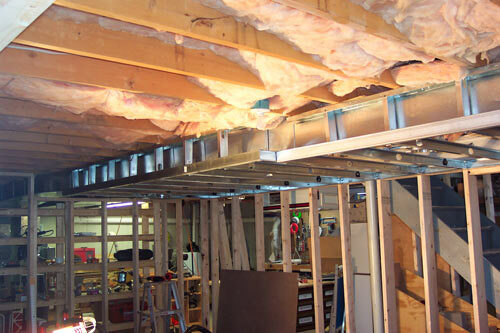 As to the I-beam, I decided to bolt 2x6's onto the bottom, providing a backing for the drywall and my steel studs that will be framing out the ducting. Log Entry 4: The framing has begun. Given the racket it causes, my wife would like it to be done yesterday; can't say as I blame her. 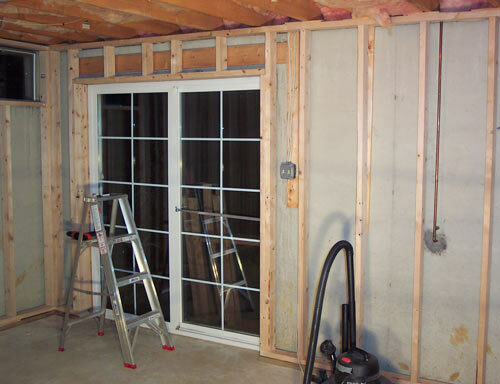 Here I've completed what I call 'phase 1': framing nearly three walls including around the window and sliding glass doors (and that pesky water line). 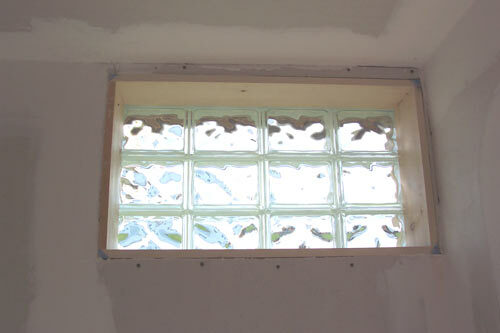 By the way, I've decided to go with a glass block window to replace the crappy one that's in there now. It's a special order at Home Depot; should be fun!. 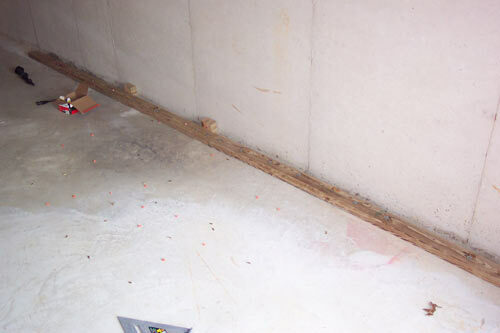 You'll note here that I'm using pressure-treated wood for the sole plate, positioned about 2" from the wall to allow air circulation (the gaps behind the walls will be open to the unfinished portion of the basement), and fastened with powder-actuated fasteners. 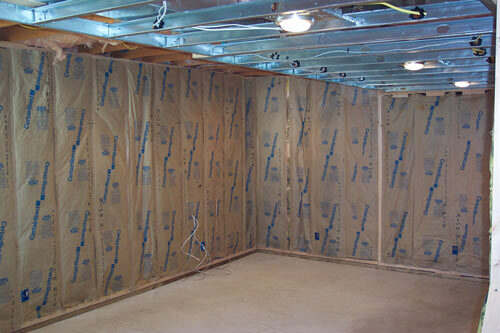 Though we have a very dry basement, I've decided to use a drywall primer that acts as a vapor barrier just to keep any condensation to a minimum if it occurs at all. So what are the other phases? Well, phase 2 is to finish framing out the two side walls under the ducting as well as the last wall that attaches to the side of the steps. Phase 3 is framing out the ducting in the ceiling using light-weight steel studs (they could have put the ducting on the side of the basement opposite the walk-out, but then builders are like that sometimes; so I'm losing a good amount of headroom for a third of the room which I'm not too excited about). Phase 4 is framing out the wall on the opposite side of the stairs as well as an opening for the steel door that will provide some noise insulation from the shop on the unfinished side (I do have to say that I'll miss the natural light that I get coming into the shop now; can't have it all I guess). I figure it'll take me a week to finish the framing; then onto flooring, electric, insulation, drywall, trim, painting then wainscoting. Whew! The end seems so far off. On a sad note, there was a death today in my power tool family. You can see it below giving up the ghost. This offers an opportunity for me to espouse my tools philosophy of always spending the money for good tools because they will be a pleasure to use and will stay around for a good long time. Usually I adhere to my own advice, but I decided to buy this imported Chicago-brand recip saw from Harbor Freight, thinking that I don't use recip saws very often, and it died today after little use. So now I'm going with a P-C TigerClaw that will also allow me to get in between the studs with its unique twisting action. Just a thought for you for your next holiday/birthday/anniversary gift (you can buy yours here!). 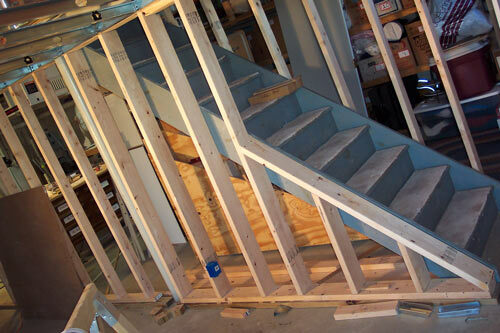 Log Entry 5: I finished framing out around the stairs. I'm 95% done with framing; only have the door to the shop to frame out and then my wife will be very pleased as the noisy part will mostly be over. 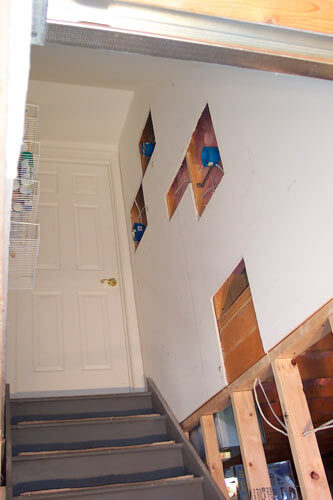 The stairs were a little tricky; on the other side there are low joist hangers and ducting to account for, and on the near side I went with 2x6s for part of the wall to steady the stairs. Once I get drywall and ballisters up it'll start looking pretty good. Log Entry 6: I finally finished the $%*&!! @ ceiling framing. Not having worked with steel studs before, it wasn't too bad; easier than I thought it'd be. 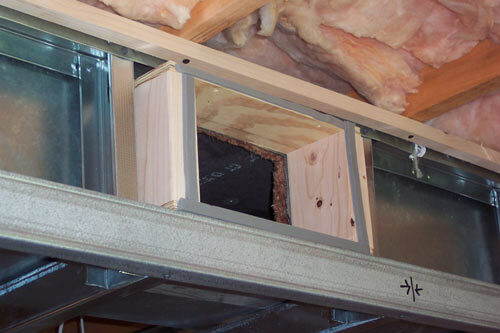 The problem came when I went to lift and attach each of the two assemblies to the ceiling and side wall track. Needless to say, this is a two-person job, however I'm not one to wait for help when I know it won't come for 24 hours, so after a whole lot of effort I finally got everything hung. The casualty was the outside track in the right picture below. In the end it was so twisted that I had to replace it with another, straight track, once it was up. 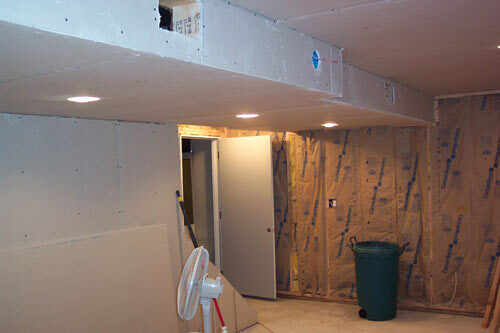 This is where the drywall will attach so it's important that it be straight. 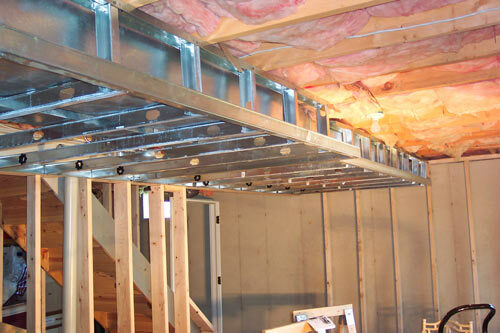 I would recommend working with steel studs; they are so much lighter than wood, and 40% cheaper as well. Plus, if you do something wrong, it's much easier to reverse things; just unscrew a screw. On to hanging the lights, outlets, switches and wiring . 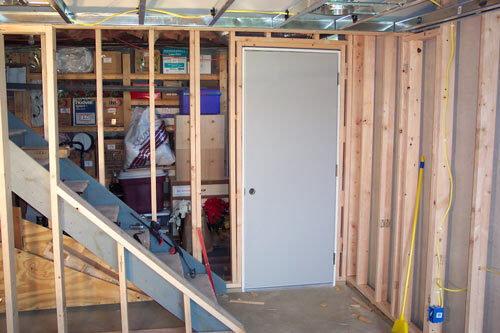 . .
Log Entry 7: Today I finally finished framing the area around the stairs and the door to the shop. You can see the result of my effort below. I've also roughed out most of the wiring and junction/outlet boxes. It was a nice break from framing while I waited for my Porter-Cable TigerClaw to be delivered from Amazon. 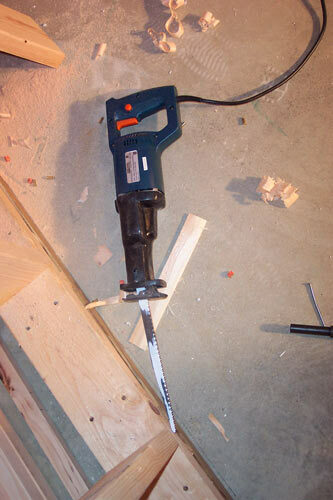 Allow me to digress by talking briefly about this saw. It's great! 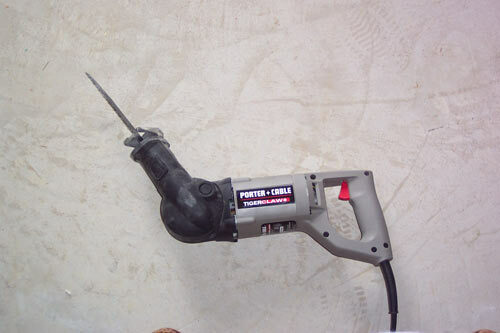 The ability to rotate the blade in both planes allows you to do most any recip job with ease. I would highly recommend this saw. The only downside to it is the vibration. If you'll be using one all day long I would recommend those gel anti-vibration gloves. 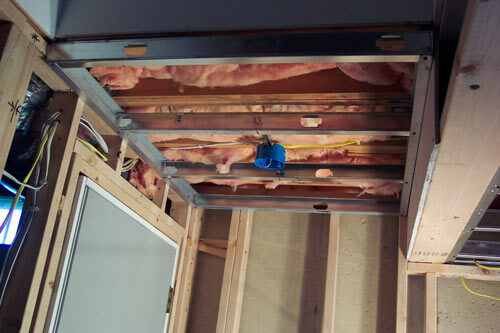 As to the wiring (I won't fess up to having to wire all of the [insulation-rated] recessed lights twice; code requires wires to be clamped, you see . . .), what's left is the trickiest part: installing two sconce lamps and switches in the stairway, relocating the ceiling light and smoke detector below, rewiring the circuit for the lights in the unfinished part of the basement, installing the breakers, and building a false ceiling to accommodate the junction box for a light I'm putting up in the landing of the stairs. 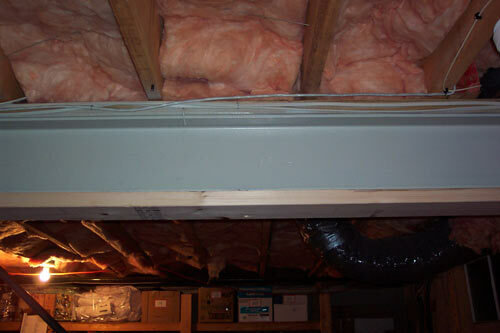 You can see in the last picture on the right, that the two joist spaces that would have accepted this box both have ducting in them (one is covered by fiberglass). Hurdles like these seem to always be popping up, which tends to get a little tedious. By the way, I'm going with a 20 amp circuit for the outlets; eight in total. 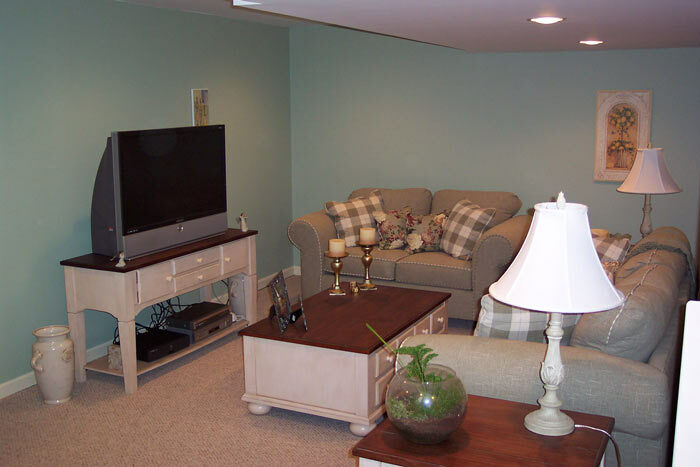 You never know what type of home entertainment system will eventually be placed in the room, so it's better to go with overkill than not have enough amperage. 20 amps will give you 20x120v=2,400 watts. The rule is to max out at 80% which works out to a common rule of 100 watts per amp; plenty for my dream system! By the way, if you would like a TigerClaw of your own, did I mention that you could buy it here? 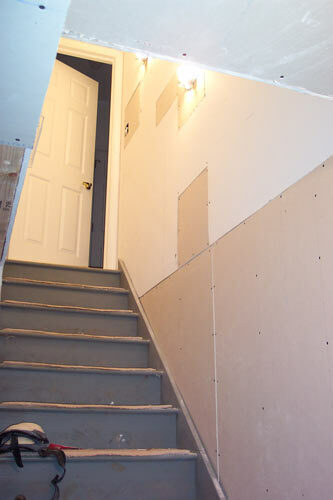 Log Entry 8: Finally, with the completion of the stairwell wiring and false ceiling above the bottom landing that you can see below, all pre-drywall wiring is now complete. Over all, two new circuits were installed, another rewired and new multimedia lines were threaded for future multimedia needs. 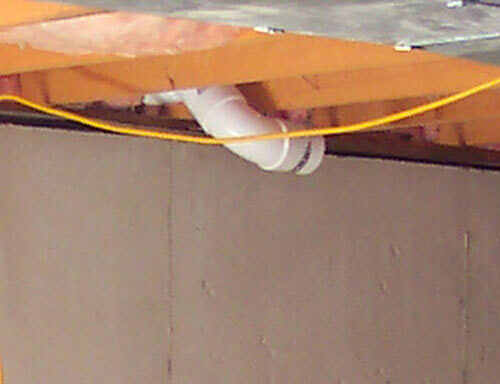 In the picture on the right you can see the speaker wires, cable and phone lines, and CAT-5e wiring that has been threaded from a router upstairs, through the attic, down the PVC pipe and into the wall. 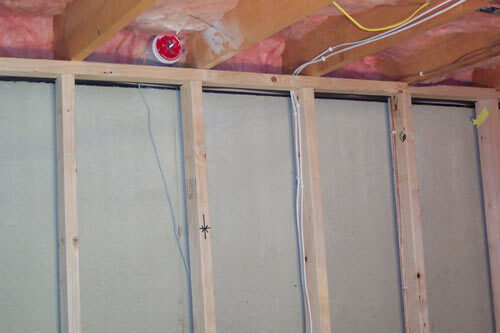 Last steps before insulation is moving the hard-wired smoke detector and framing out the two HVAC vents. Log Entry 9 - 10/6/03: Well, it's been a month since I first started this project. Let me pause to take a breather . . . 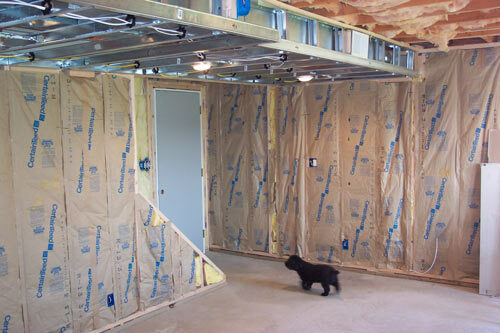 Okay, having moved the smoke detector and having framed out the two HVAC vents, in the picture at left below, I was ready to start putting up the insulation. 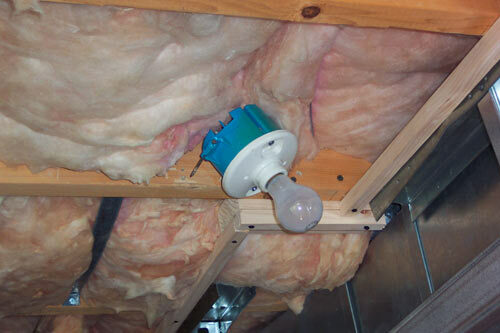 Over the course of the next two days, I reached another milestone, having completely installed the insulation (I chose to use the encapsulated stuff; it's more expensive but much less of a mess, although having to tear the batting in half to get around the electrical wiring defeated some of this benefit). For the first time you can get a good perspective on the definition of the room size. In the third picture you can also get a glimpse of my shop pooch; our toy/miniature poodle whose company we have enjoyed for over eight years. Next stop? 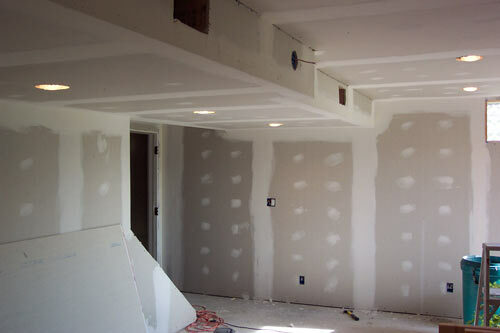 Putting the ceiling drywall up. I'm hoping that doesn't take more than a couple of days. 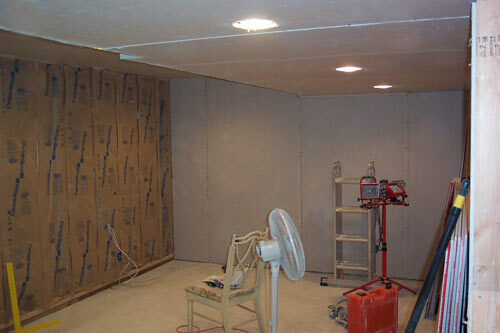 Log Entry 10 - 10/10/03: Phase one of project 'hang drywall' is complete; that is, the ceiling and two of the four walls have been hung. With the help of a couple friends, Mike D. and Mike S., it only took about six hours. Phase two, the balance of the hanging, will go up later this week. Then it will be on to taping; any volunteers?? 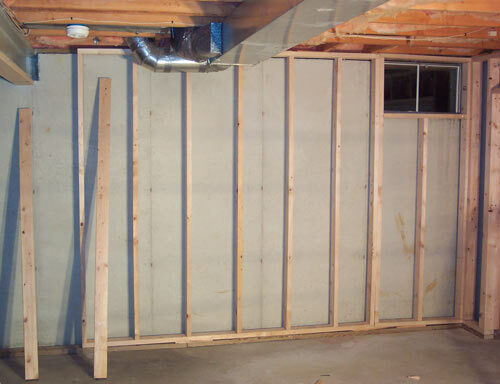 Log Entry 11 - 10/25/03: It's been two weeks and I am pleased to say that phase two of the drywall is complete; all walls are hung and the taping and spackling is nearly done. I paid a friend of mine to do this as 1) I'm not the greatest spackler and 2) I hate doing it (perhaps the two are related??). Thanks Dave G. for helping out. 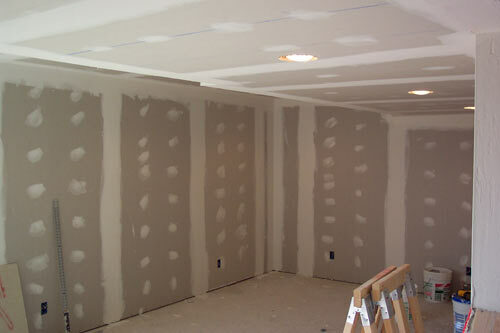 By the way, let me recommend the vinyl beading that adheres to the drywall with an adhesive spray. So much easier than screwing metal beading on. 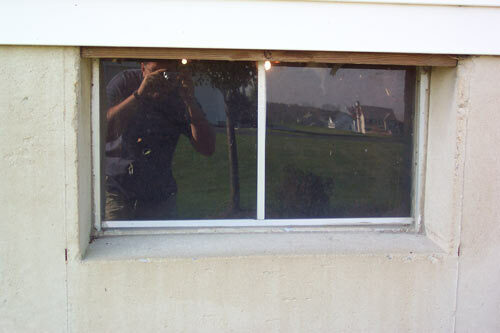 The first photo below is of the original basement window; the typical cheap pull-out type found in most of America's basements (yep, that's me in the reflection taking the picture). 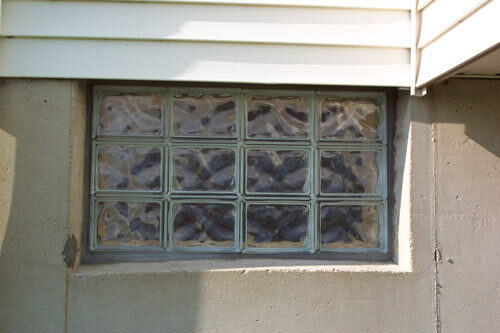 I chose to replace it with a custom-made glass block window from Home Depot. You can see it below as well. I thought it was reasonable for about $85 and adds a lot to the looks of the room. Thanks to Tom L. for his skills in putting it in. Dave and Tom both did a great job. 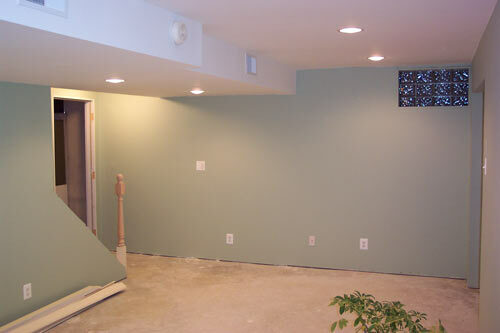 Once the final sanding is complete, it'll be time to paint on the drywall sealer; it's a special sealer from Benjamin Moore that acts as a vapor barrier, and after that it'll really start looking like a real room. Log Entry 12 - 11/2/03: The final sanding. sweeping and cleaning up of spackle from the floor, is finally done. Today the first coat of sealer will go up. I'm anxious to see how well the sealer hides the tape marks, small imperfections and such. We also were out shopping for carpet and paint. The end is in sight and I can't wait to move the furniture in and take a nap! 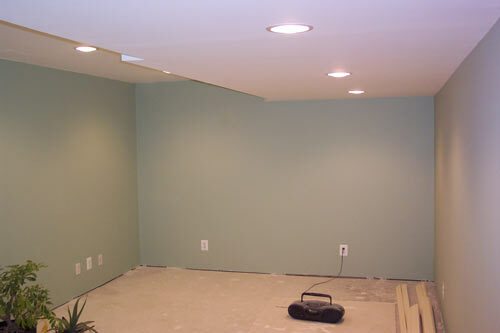 Log Entry 13 - 11/17/03: The paint is now up and I think the sage green my wife picked out looks great. I pre-painted all of the trim a cream-like color; it's a pleasing combination. 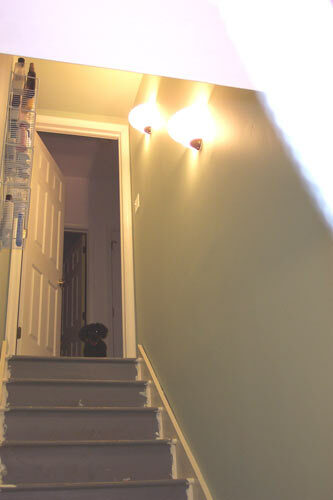 The sconce lights in the stairwell turned out well also. Now we wait for the carpet to go in tomorrow. Then it's onto the trim and it'll just be about finished. 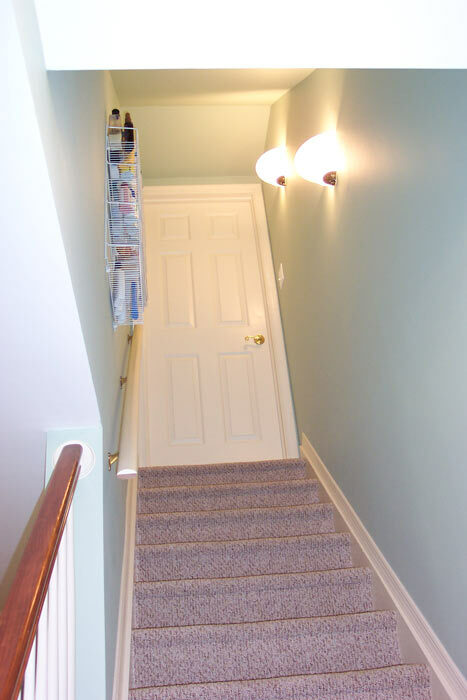 One note: I found out the hard way that you really need to screw the banister to the wall; nails don't provide enough holding strength to withstand the stress that a stair rail receives through daily use. 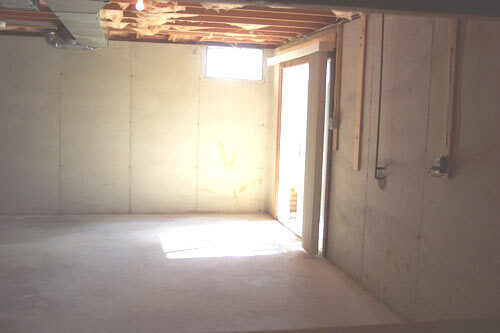 Log Entry 14 - 11/20/03: Now that the baseboard and trim is finished (definitely put up the trim before the carpet goes down or you'll end up with gaps where the floor is uneven) and the carpet is down, the following pictures are of the finished room; both without and with furniture. It's amazing how the room shrinks when you put furniture in it. The couch is a pull-out queen sleeper for when guests come over (the love seat is really a sage green though it looks brown in the photo). The matching sofa table is where I put my wide-screen 43" DLP television (if you're thinking of going plasma, bear in mind that plasma screens are more expensive and susceptible to burn-in, a risk you take when playing games on your PlayStation or if you don't stretch width-wise all of the non-high definition programming). By the way, if you've viewed our Jamaica vacation pictures, that giraffe in the corner will look familiar. All in all, I don't know if I'd tackle this home improvement project again if I could actually afford to have someone do it for me, but it's sure been a learning experience. Well, on to the next honey-do project I guess!